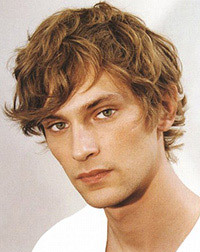 Mathias Lauridsen was born in Copenhagen, Denmark, on January 13, 1984, is a Danish male model. He was discovered in 2003. He made his catwalk debut for Marc Jacobs and Miu Miu in New York (2004). Vogue ranked Mathias as one of the top 10 male models of all time. He was number one on models.com Top 50 Male Models list, for more than two years. His hobbies are drawing, watching films and soccer. He married Swedish stylist Zara Zachrisson in 2014, they have a son. He has a scar on his left cheek. V Man, Details Cover, Dazed & Confused Korea, WWD, Hero, Cover Man, L'Officiel Hommes Italia Cover, Hercules Cover, Numero Homme China, Nordic Man Cover, Dansk Cover, Bund Cover, GQ Russia, Vogue Italia, 10 Men, i-D Magazine, L'Officiel Hommes, Another Man. Costume National, Hugo Boss, Massimo Dutti, Harrolds Australia, Gap, Adolfo Dominguez, Eton of Sweden, Giorgio Armani, AG Adriano Goldschmied, Gucci, Scotch & Soda, Lacoste, Theory, DL1961, Filippa K, Mango, Fendi, Aldo Shoes, Bottega Veneta, Esprit, H&M, Carolina Herrera, Coach, Uniqlo, Emporio Armani, Salvatore Ferragamo, Joop, Diesel Black Gold, Free Soul, Marc O'Polo, Trussardi. Walked runway for Tommy Hilfiger, Bottega Veneta, Hugo Boss, Prada, Michael Kors, Massimo Dutti. Represented by agencies Barcelona Sight Management Studio, New York IMG, Paris Premium Models, Scoop Models Copenhagen. I feel like I have a good aesthetic eye. In Copenhagen, I have my own apartment, my mom and dad, my family in general all my friends from way back. I thought about moving to New York, to Paris, to where ever it would make sense but, I just feel so comfortable at home.